As someone that follows various aromatherapy and perfume forums I always find it interesting reading people’s opinions about the fragrance descriptions of rose oils so I thought I’d create a little page and share my thoughts about the fragrance of various Rose oils that I have experienced so far. To make it more enjoyable my Bulgarian producer has taken some photos for me, all uploaded. So here goes! I find the fragrance of Bulgarian damascena absolute (Rosa damascena) to be enigmatic at first. Initially it is quite a mild and spicy floral. As the fragrance develops the smell of rose becomes clearer and the sweet pink rose notes combined with soft honey notes have a great deal of strength and long-lasting depth. The colour of damascena absolute is orange-yellow and the consistency is of a slightly thick viscosity but pourable nevertheless. At the moment I have not experienced damascena from any other origin so can’t comment. 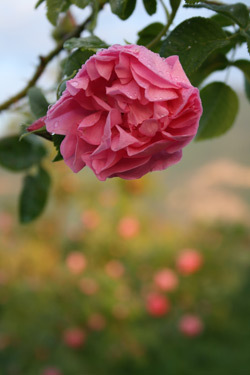 Personally I prefer the initial fragrance that my Moroccan centifolia absolute (Rosa centifolia) exudes. This is far easier and slightly more enjoyable fragrance for my brain to process, it is instant sweet, deeply rich and a tenacious floral rose I find. The aroma however is nowhere near as long lasting as Bulgarian Damascena in my opinion. The colour of centifolia absolute is orange-red and the consistency is of a thin viscosity. Centifolia species is also known as Cabbage Rose due to the aesthetic and justifiable similarities. 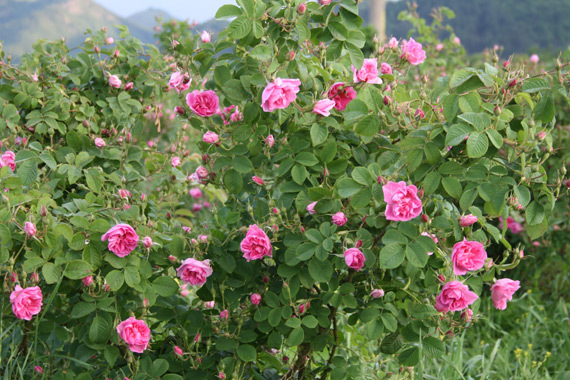 Rose damascena & centifolia absolute are produced by solvent extraction. The process is as follows; The flowers are placed in a vat with hexane which draws out the aromatic compounds as well as other soluble substances such as wax and pigments. The outcome is a waxy mass, known as a concrete. The concrete is then mixed with alcohol which dissolves the aromatic constituents, leaving behind the wax and other substances. The alcohol is low-pressure evaporated, leaving behind the highly fragrant, intensely strong substance known as the absolute. I appreciate the concerns about solvents being left behind but this is 2012, the level of investment in Bulgaria alone since 2005 is significant and so the very suggestion now is absurd but if you are still unsure then I advise CO2 offerings which I will discuss as well. The fragrance of damascena essential oil (Rose Otto) is light years ahead of damascena absolute in my humble opinion and possesses a fervent, jaw dropping, beauteous wow factor. With damascena essential oil from the first moment your brain processes the smell you are greeted with a sweet, intensely fresh, rosy fragrance that is exceptionally long lasting and that has very gentle undertones reminiscent to me of a synergy of bourbon geranium and soft citrus. Distillation: Rose damascena essential oil (Rose Otto) is produced by steam distillation with a twist so I think it’s very important to write about this as it confuses a lot of people plus a lot of inaccurate and superfluous information is online at present. The rose flowers are soaked in water and distilled in containers upto 10 metres cubed. The distillate separates continuously in a Florentine flask into water and oil. The two are separated and the water is then distilled for a second time (known as ‘cohobation’).This is important because the yield from the second distillation is several times greater than the first with more of the water-soluble components being captured, in particular, phenyl ethyl alcohol which has a warm and mild rose honey like odour . The two oils are mixed together to form Rose Essential Oil. The blending of the 2 oils is the final act. The batches from different distilleries and micro-geographical regions, varying lightly in aroma nuances and composition, need skilful blending for preparing grades of rose oil. Blending is a really qualified piece of work resembling the creativity of the perfumer. It requires a specific background, vast training and experience.This involves specialists in chemistry, olfactive analysis and evaluation. Note: You will find Rose damascena essential oil crystallises at between 5-8ºC. Rest assured there is nothing wrong with it and it is quite beautiful visually. All you need to do is give your bottle a shake (with cap on) and it will be liquid again. The fragrance of Bulgarian damascena CO2 (Rose Otto CO2) is a long lasting diffusive accord of deep, warm, rose notes and I detect a fruity honey tint comparable maybe to Spanish orange blossom honey. This material is a soft wax consistency, dark yellow to medium orange in colour, applied to the skin I have to add the feeling is sumptuous, really silky smooth, penetrating the skin effortlessly. 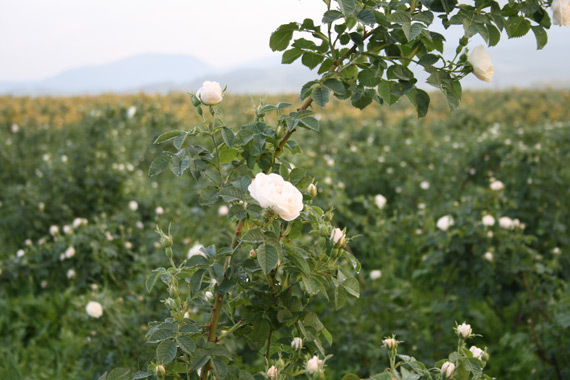 The fragrance of Bulgarian alba Co2 (White Rose CO2) is resplendent, salacious and highly seductive. It has similarities to the damascena essential oil but there are distinctive aroma qualities separating the two species apart. For me this is the summer breeze of roses, delicate, fresh, playful rose notes greet me, the potency slowly and effortlessly starts to increase. The middle has free flowing honey rose qualities with a citrus tang that is sharp, sparkling, possessing extreme impetuous charm. This creates an environment for me to find inner calm, no floral oil at all enables me to collect my thoughts and feel as peaceful within as this fragrance. CO2 extraction method is very clever. Using high tech machinery which enables high pressure and low operating temperatures, carbon dioxide (CO2) is turned into a liquid gas (supercritical state) and is used as the solvent to draw out the active and thermo sensitive goodness from the rose petals. This process is very quick and when complete the CO2 is released in a gaseous state that leaves behind the rose oil totally free of trace solvents. Also the near ambient critical temperature (app. 30 deg. Celsius) makes it perfectly suitable for the thermolabile ingredients if compared to the steam distillation process where the temperature of the steam is 120-140 deg. Celsius and some ingredients and chemical compounds of the extracts are converted or totally destroyed by the heat. Finally for now I want to end by thanking Doncho Papasov from Bulgaria (Kazaluk). He is credited with founding the first Bulgarian Rose Trading Company for production and export of rose oil in 1820, Doncho, I salute you good sir!